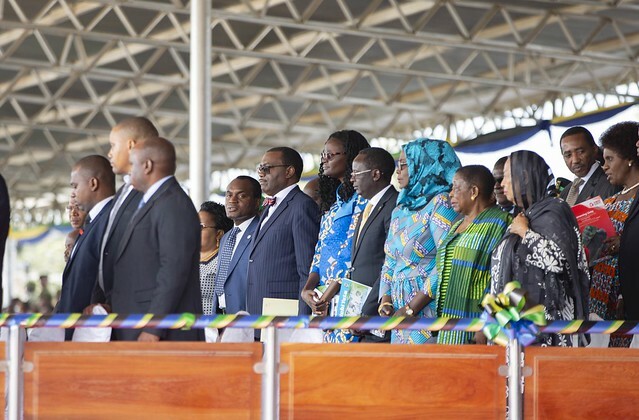 At a national event at Jamhuri Stadium in Tanzania’s capital, Dodoma, marking the 54th anniversary of the United Republic of Tanzania – the union of the Republic of Tanganyika and the People’s Republic of Zanzibar – Tanzania’s President John Pombe Magufuli praised the African Development Bank for financing projects that have had a transformative impact in his country. “On behalf of the people of Tanzania, I would like to thank the Bank for the support it has provided to Tanzania over the years, which has contributed positively to our country’s socio economic development and transformation. “I see the African Development Bank as the best partner for our development,” President Magufuli remarked. The high-impact projects executed by the Bank have spanned improved water and sanitation, roads construction, energy and several infrastructure development interventions across the country. He also urged the Bank to fund more projects in Dodoma to support his government’s quest to officially move to the city this year. Speaking with Bank President Akinwumi Adesina at the State Lodge, where Zanzibar President Ali Mohamed Shein also commended the Bank for its work across Africa, Magufuli said, “I am very impressed with your vision and focus, and with how you are steering the affairs of the Bank in five critical issues, the High 5s. They are at the top of the agenda of the Government of Tanzania.” He added that his government has submitted other project proposals to the Bank and asked for additional infrastructure funding for the move to Dodoma later in the year. The African Development Bank has supported Tanzania since it began operations in the country in 1971, and has invested nearly US $4 billion, with an active portfolio of US $2 billion that includes investments of over US $1.1 billion in road construction covering 1,400 kilometres and US $200 million in the power sector. On April 27, Adesina and Magufuli officially open the Dodoma-Babati road project that was co-financed by the Bank and the Japan International Cooperation Agency. This important network links the central and northern regions of Tanzania and part of the East African Community trunk road network, the Southern Africa Development Community Regional Trunk Road Network, and the Trans-Africa Highway from Cape Town to Cairo. It will link Tanzania to neighbouring Zambia in the South and Kenya in the North, as well as to southern and northern African countries and is expected to accelerate the movement of people, goods and services.